Hey! This thing is still a Work in Progress. Files, instructions, and other stuff might change! Folger Tech Sliders and Carriage Remix for Limit Switch Micro Adjustment by GeoDave is licensed under the Creative Commons - Attribution license. The main reasons I modified this design was to add a micro adjust screw to the top of the slider and be able adjust the diameter of the holes slightly. This is my 1st Delta build, but having a micro adjust screw on my Prusa printer seems to be quite handy & this looked an easy change. 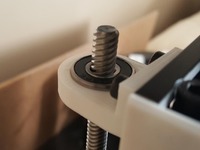 I dipped down the top middle of the slider to add the M3 adjustment screw without loosing any or very little height. If you have the screw even with the top of the slider, you loose no height. I added an optional slider with one side flush that is mirrored so the side with the wheel is opposite side of limit switch circuit board. This should allow that side of the carriage to ride over the limit switch circuit board & giving you a little extra height. It is there if you want to play with. You might have to add 1 to 2mm in height of the base of the slider to be a comfortable miss of the limit switch board. After about 50 or so hours of printing, I had a problem with the belt causing a motion problem with one of the carriages as it moved up & down. It may have been that it picked up some plastic debris over time that caught there, but I do not like the right side of the belt touching the right clamped side as it moves. I am redoing the Carriage design to give 2mm more clearance for the belt to pass thru which should miss rubbing against the wire tied bottom belt. For the top right belt connection, I am using a self locking belt clamp in the carriage. I might try the flush top slider since I have to take this apart anyway. Looks like that should work after looking at assembled. The 3xsliderv2_Mod_Rev10.stl file should not change any of your Delta geometry of the original & you should be able to use any carriage with the same hole patterns as the original. I traced the original STL files from Folger Tech using a workflow of converting STL files to DWG using TurboCad Deluxe & working with the DWG files in DraftSight Pro, then using openscad to create the final 3d model from dimensions and polylines I derived from DraftSight. 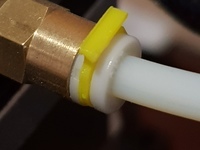 This part could probably be used for other Kossel 2020 Delta's, but was created to be used with the Folger Tech Kossel 2020. 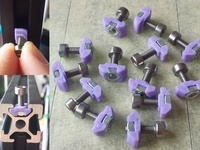 There is a test print I would recommend printing 1st to test whether your printer prints the holes & nut traps the correct size. If it does not you can change the associated variables in the openscad files to the numbers that work for you. To create a new test part, change the variable TestCutON = 1 in the 3xsliders2_Mod_Rev10.scad file. For the slider, I changed the top spherical connection at the wheels to a conical cylinder as that seemed to be a better connection at the wheel bearing than the less surface of the sphere. In the wheel holes, I tapered the hole at the correct height for a better print & better Length fit of the M3x20 Flat head screws. 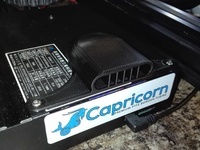 I modified the inner cut at the top to allow for a longer limit switch adjust screw if needed. I started the rounding higher on the single wheel side above the wheel adjustment screw so the screw head would be on a flat surface. For the Jamb Nut slot I added a little hole on the bottom so I could retrieve the nut by pushing a small allen wrench thru to push the jamb nut out. I got tired of trying to get that jamb nut out of parts I was not quite happy with. I also rounded the sharp corner at the bottom of the inside cut. For the carriage, I did not make many changes. I wanted to be able to adjust the diameter of the holes as they are usually a little too tight for me. I added the option to countersink the bottom 2 M3 holes, so I could use a M3x12mm cap screw instead of the M3x16mm button screw. Seemed like the M3x16mm screw went too far thru for me & I had some M3x12mm cap screws on hand. Let me know if you have any problems with this design. I am new to the Delta style printers and have not finished putting this Delta together yet, so something may change with this as I get further into my build. To get a little more height, I may be able to angle the limit switch out using this idea http://www.thingiverse.com/thing:1161094 if I can miss the belts. I won't know that until I put the belts on. Say thanks by giving GeoDave a tip and help them continue to share amazing Things with the Thingiverse community. Say thanks and help GeoDave continue to share amazing Things with the Thingiverse community. You'll need a PayPal account to tip GeoDave. Click the button below and you will be redirected to PayPal. Once the payment is complete, you'll be brought back to Thingiverse.